The MSI 15.6" GE62 Apache Pro-001 Gaming Laptop is powered with a 2.6 GHz Intel Core i7-6700HQ processor and 16GB of DDR4 RAM to make it a suitable Windows 10 system for use at home or at work. It features a 15.6" display and a 1920 x 1080 resolution so you can comfortably view your spreadsheets or games. To help process 3D textures and shadows, it comes built with a dedicated NVIDIA GeForce GTX 970M graphics card with 3GB of video memory. Moreover, it has a SteelSeries keyboard that offers full-color backlight and Anti-Ghost keys so you can swiftly input commands when playing games. This notebook comes with a 128GB SSD that provides quick boot times and nearly instant access to your applications. It also has a 1TB hard drive, which offers ample space to store your photos, videos, and files. To quickly access external drives, it features a USB 3.1 Type-C port that supports data transfer speeds up to 10 Gb/s. Additionally, it provides a USB 2.0 port and two USB 3.0 ports to connect with other peripherals such as scanners and printers. MSI has built this notebook with a SuperMulti DVD burner so you can create home movies on DVDs. You can also share your home movies online by using the integrated Intel 3165 wireless 802.11ac Wi-Fi card or Killer E2400 Gigabit Ethernet controller. For audio, this notebook comes equipped with four speakers and a subwoofer to immerse you in sounds. Without disturbing others, it has gold-plated audio jacks as well as amplifier so you can listen using your headphones. Other features include Bluetooth 4.0, a webcam, a microphone, a memory card reader, an HDMI port, and a DisplayPort. 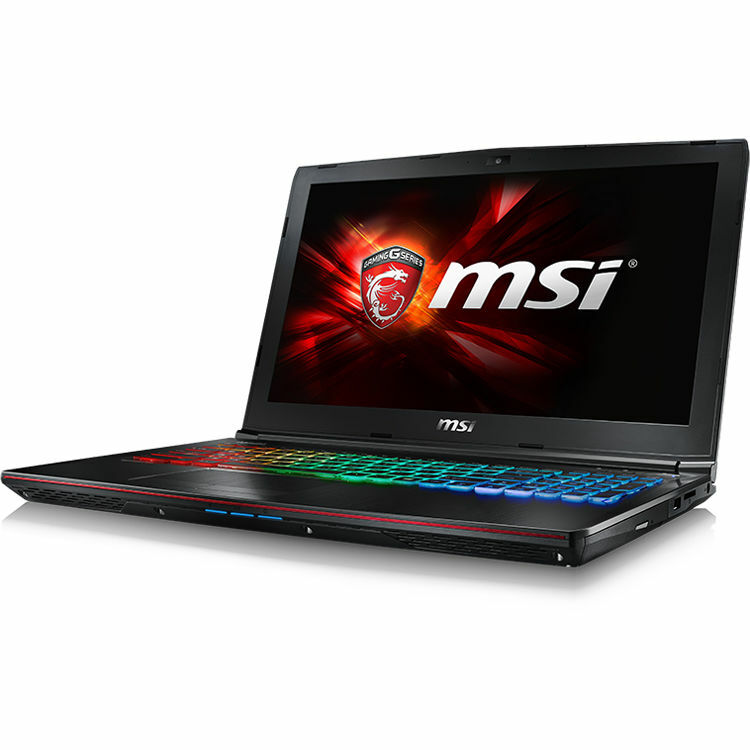 The MSI GE62 houses a 6th-generation Skylake Intel Core i7-6700HQ processor. Its quad cores can reach a stock speed of 2.6 GHz. The processor also can provide speeds up to 3.5 GHz, thanks to Intel Turbo Boost 2.0 technology. Additionally, it features 6MB of L3 cache as well as Hyper-Threading technology, which enhances the cores. Built for an immersive gaming experience, the NVIDIA GeForce GTX 970M arms you with industry-leading technologies including dynamic PhysX effects, CUDA, and more. Based on NVIDIA's Maxwell GPU architecture, the NVIDIA GeForce GTX 970M provides optimal performance per watt. This notebook supports DDR4 memory, which offers faster performance than previous generations. Transferring data between devices is faster with the USB 3.1 Type-C port. With transfer rates up to 10 Gb/s, it quickly backs up data from this notebook to an external drive. Additionally, it features a reversible connector that helps you connect a USB Type-C cable on the first try. Cooler Boost 3 comes with two fans that provide intelligent cooling for the GE62 notebook. It also has designated heat pipes that reduce heat generation and increase heat dissipation for the CPU and GPU. MSI True Color technology provides multiple viewing modes, each precisely calibrated to deliver vibrant colors and sharp images. Gamer mode increases brightness for gaming. Anti-Blue mode reduces potential harmful blue light. sRGB mode sets the screen to 100% sRGB of color gamut. Designer mode increases clarity for lines and words. Office mode reduces eye-strain after long term use. Movie mode optimizes contrast for vivid movies. With Matrix Display technology, the MSI GE62 supports multiple external displays so you can multitask via HDMI and mini DisplayPort. Stream on Twitch or watch your favorite shows while playing your games. Fill the room and feel the bass with four Dynaudio high fidelity speakers. Drop the beat or feel the thunderous roar of the battlefield with an integrated subwoofer. This notebook also comes with audio jacks so you can connect with external speakers or a headset. This MSI GE62 notebook comes equipped with an ESS Sabre HiFi Audio DAC that upgrades the audio experience when using your headphones. It provides immersive sound effects and enhances sounds you may have missed. Originally developed for military fighter jets, Nahimic specializes in 3D sound software processing and audio improvements offering virtual 7.1 sound in immersive high definition. Designed to work with standard audio and stereo equipment, Nahimic transports gamers into the action, allowing them to sense every footstep, hear every bullet whizzing past, and feel every explosion. It also features a high definition audio recorder to easily capture and stream studio quality sound and is only available on MSI gaming laptops, including the MSI GE62. Use the fully illuminated SteelSeries keyboard, which has tactile fast action keys, a strategic layout, and powerful customization capabilities. Modify the color, macro every key, and enhance the way you play with the SteelSeries Engine app. This keyboard also features silver lining printed keys that provide long-term wear and tear. MSI includes the Killer Shield manager app that protects and prioritizes the networking traffic. It also helps prevent lag spikes so you can play your best. XSplit Gamecaster version 2 lets you record your gaming moments and broadcast your live gameplay sessions to Twitch, YouTube, UStream, and more. It's simple, user-friendly, and ideal for sharing your gameplay with the world. Box Dimensions (LxWxH) 17.0 x 13.0 x 3.5"
15.6" GE62 Apache Pro-001 Gaming Laptop (Aluminum Black) is rated 4.6 out of 5 by 7. Rated 4 out of 5 by George H from Great performance/value, but lack other things. I previously had an ASUS ROG 17' laptop that has served me well for over 4 years and I thought it was time for a change. I needed something smaller (15'), lighter, and most importantly, I wanted a laptop that is capable of running all the current games in medium/high settings (I can settle for 30+ fps, 60fps ideally). At the very least I wanted a GTX 970M with an SSD.Oddly enough, not many laptops fit these requirements and stay under a reasonable price (around $). So I bought this MSi GE 62 Apache Pro-001 (also known as GE62 6QF). Do not confuse it with the base model, which comes with a GTX 960M and with no SSD.So, after a few days of heavy usage, I can list pros and cons.PROS:- Nice specs. I can run Heroes of the Storm with the highest settings and games like GTA V in high settings and still get around 40fps.- Having a SSD is always nice for low loading times. In 15 seconds you can be in your desktop screen. Also, it comes with 1TB of HDD storage for movies and such.- It is light! After having a 5kg laptop, I was pleasantly surprised with the weight of this laptop, which is roughly the half (around 2.5kg).- It comes with some software that allows you to switch between different modes of performance (i.e. ECO, Gaming...).- The keyboard is made by SteelSeries, and it feels nice. Also, you can change the lighting effects and the colors.-It comes with a USB 3.1 type c, which will come handy in the future.-It also has two ports that allow you to connect two screen with a resolution up to 4k.CONS:- The build quality is not very good. You can feel that the bottom of the laptop is made out of cheap plastic and I can literally see a good portion of the inside of the laptop. It worries me that it gets dust.- The SSD only has around 60GBs of free space after installing Windows. So forget about having your Steam games in there (considering that most modern games weight around 30GBs).- The keys in the keyboard have a weird distribution. There is no Windows key on the left side and it feels really awkward. Also, keys such as Delete and Prt scr are in a different position, which can be frustrating at times.-It took me an entire evening to fix some software issues. For instance, some function keys were not working, or I couldn't switch between performance modes. Eventually I could fix it, but it was annoying, considering it is a brand new laptop.-This is not a con per se, but it comes with a DVD reader. I wish they could have used that space for something else.Overall I would recommend it to someone that travels from time to time but still wants some portable horsepower. The build quality is far from great, but it you are careful, it should last you for a long time. That said, you get a lot of performance for a great value.PS: Try to buy it when Nvidia has a game promotion. I got Rise of the Tomb Raider for free, which is valued $ in Steam. Also, the sales rep in B&H had no idea about this promotion and told me to just buy the game in Steam. I wish they knew a bit more about that, but oh well. Rated 5 out of 5 by Anonymous from Mobile Powerhouse Everything about this laptop has been great. Hardware works as advertised. Booting and restarting take about 5 seconds due to OS installed on the SSD. Just remember to install all new software into the (D:) hard drive and not the (C:) SSD. I do have a few complaints however. All audio has an echo effect. To turn off, simply go to the Nahimic Audio software and lower the REVERB effect to zero. The laptop gets hot very quickly. When not gaming, temps are 30-40 degrees Celcius. When gaming, temps reach as high as 70 degrees Celcius and could probably go higher. The keyboard starts to feel very warm and uncomfortable so I use the Cooling Boost button to turn on both fans to 6k rpm to keep the laptop around 50 degrees Celcius. The fans are pretty loud though. Another thing is that the casing around the keyboard has a vertical metal scratchy design that although looks and feels very nice, there's a weird gritty effect. If you hover your wrist/hand over the casing as you use the keyboard, it feels as if something is chaffing your skin. It's only a very minor psychological effect. It does not actually cut your skin. Maybe I'm sensitive or something but it's worth noting and letting other people know. Rated 3 out of 5 by Anonymous from Doesn't have a good battery It's a great computer, the only thing is that the battery last way too little. That's something to think about before buying it. Rated 5 out of 5 by Seng from I like this pc. This pc is all I want for both school and gaming. How long is the battery life with the 970m? The battery will last about 6 hours, depending on use. This laptop looks amazing but it'll be my first time ordering a laptop online. That makes me nervous, so is there any laptop support from B&amp;H? What if something goes wrong with the computer? My son saved up his money and wanted a good gaming laptop. After a lot of research, we went with this model. It has been outstanding and he is extremely happy with his purchase. The graphics are wonderful, the performance is great, and overall, it's a terrific value for the price. Thank you for your question Shashank!Absolutely!MSI is known for building very powerful gaming machines at extremely reasonable prices. We always try to ensure that you get the most value for your dollar.This graphics card is a GTX 970 which is extremely popular and powerful along with a nice SSD hard drive and 16GB of RAM! It is a really great buy!Hope this helps! No, you will need a converter. Does it come with a Windows 10 disc? I'd like to remove the hard drive and put in a large SSD drive in it's place. But of course then I'll need to reinstall Windows. No, you would need to burn a disck. I'm seriously considering this machine, it's got all the hardware I want/need plus it has a dragon on the cover of the notebook that lights up... My question is, how much bloatware does this thing come with? Will I have reload the entire machine to get rid of it when it arrives? Is the usb 3.1 type-c on the GE62 Apache PRO 001 compatible with thunderbolt?